Australian sprinter Michael Matthews bounces back from a tough crash in Paris-Nice in the best way possible, with his first win of 2019 at Catalunya. Sunweb’s Michael Matthews looks to have his spring season back on track with a victory in stage 2 at Volta a Catalunya Tuesday. The Australian recovered quickly from a traumatic crash in Paris-Nice earlier this month and sprinted to his first victory of 2019 in Sant Feliu de Guixols, Spain. World road champion Alejandro Valverde (Movistar) was second in the sprint, and Daryl Impey (Mitchelton-Scott) finished third. Thomas De Gendt (Lotto-Soudal) kept the overall lead that he earned on Monday with a bold solo breakaway to win stage 1 of the seven-day race. 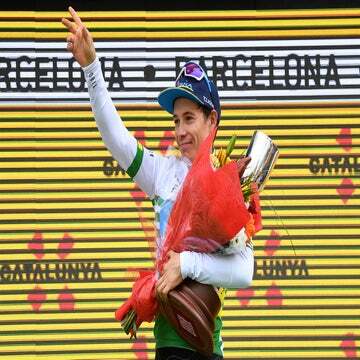 The 166.7km stage culminated with a one-kilometer uphill kick to the line. Natnael Berhane (Cofidis) tried to catch the peloton off-guard with a late attack inside of the final 10 kilometers, but the bunch wasn’t about to let the Eritrean ride clear. The peloton was back together and under control with five kilometers to go. Into the last kilometer, Mitchelton-Scott took charge of the peloton with Dion Smith riding as lead-out for Impey. Matthews lit the afterburners in the final few hundred meters to the line and won by a comfortable margin. After crashing out of Paris-Nice in stage 1 and suffering a concussion, Matthews’s 2019 season was in doubt. He had come off of two big WorldTour wins at the end of 2018, at Grand Prix Cycliste de Quebec and Montreal. Expectations were high for him to deliver in the cobbled classics, which begin in earnest this weekend. Fortunately for Matthews and his Sunweb team, he recovered more quickly than anticipated and rode the season’s first monument classic, Milano-Sanremo, finishing a respectable 12th place. 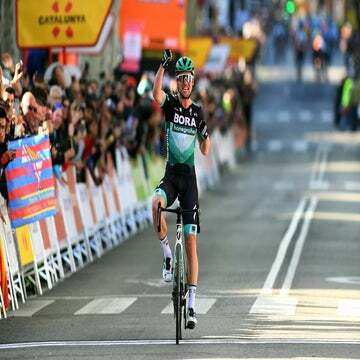 On Wednesday, Volta a Catalunya’s third stage will feature a much more selective finish with a massive climb to Valter 2000, averaging 7.7 percent over 11 kilometers to finish at 2,148 meters above sea level after 179km of racing.